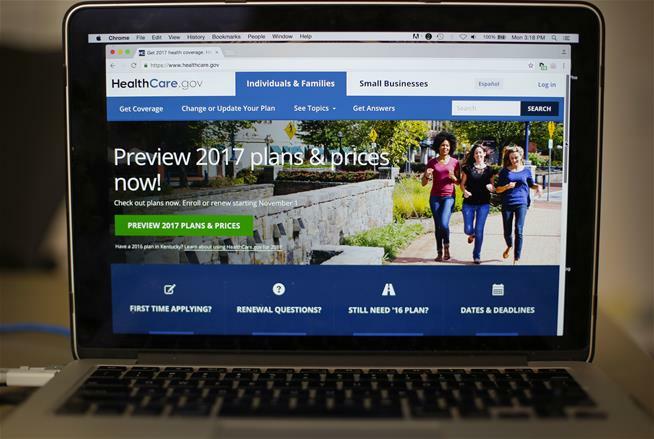 (P1) Premiums will go up sharply next year under President Obama’s health care law, and many consumers will be down to just one insurer, the administration confirmed Monday. That’s sure to stoke another ObamaCare controversy days before a presidential election, the AP reports. Before taxpayer-provided subsidies, premiums for a midlevel benchmark plan will increase an average of 25% across the 39 states served by the federally run online market, according to a report from the Department of Health and Human Services. Some states will see much bigger jumps, others less. (P2) Major national carriers such as UnitedHealth Group, Humana, and Aetna scaled back their roles, meaning about one in five consumers will only have plans from a single insurer to pick from. Republicans pounced on the numbers as a warning that insurance markets created by the 2010 health overhaul are teetering toward a “death spiral.” “It’s over for ObamaCare,” Donald Trump proclaimed at a campaign rally Monday evening in Tampa, Fla., promising that his own plan would deliver “great health care at a fraction of the cost.” Administration officials, however, stress that subsidies provided under the law, which are designed to rise alongside premiums, will protect most customers. Describe your country’s healthcare system? Do you think healthcare should be free for everyone? Why or why not? What is your opinion about the ObamaCare health program in the USA? By what percent will mid-range health care plans increase? Which insurers will decrease their roles in the ObamaCare program? Who said ObamaCare is finished?